Wouldn’t it be great to have some special little planters to use where the drainage was perfect and the plants could be healthy and growing in a replica of their native habitat? 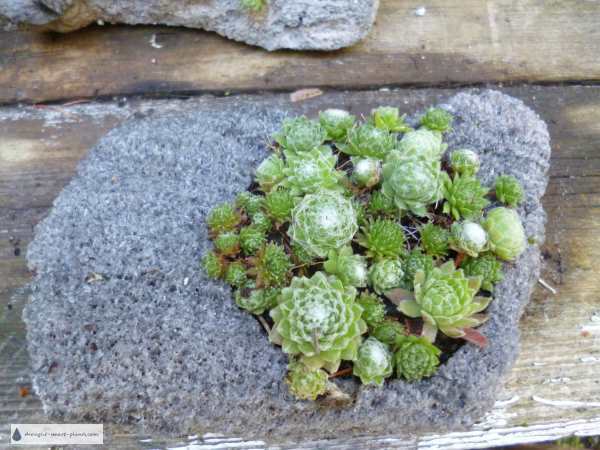 These lava rocks are available for planting with all kinds of plants; mosses, ferns, succulents – all these look fabulous, and will combine perfectly with all kinds of other containers like rustic salvage, hypertufa and terracotta clay pots. In their natural habitat, in the high mountain ranges of the Balkans and Carpathian mountains, Sempervivum and Jovibarba have evolved to take advantage of the great drainage in volcanic areas. Where there are cracks and crevices, these wonderful little hardy succulents thrive. Their roots seek out moisture deep in the rocks, and they relish the hot sun and warmth retained by the stone after the sun has gone down. The tiny pores left by escaping gases as the lava cools make little reservoirs for moisture and air, another crucial factor in the success of these plants. 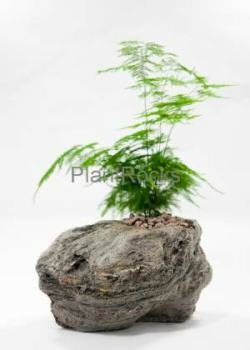 The plants can’t survive without good soil air around their roots. These air pockets also contribute to good insulation from cold, and help the roots withstand cold winter temperatures. 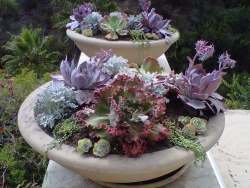 Hardy succulents really like a container with good 'tooth' or rough surface for their roots to grab hold of. As an added bonus, this type of roughness will promote lots of smaller roots. This helps them survive really tough challenging conditions. 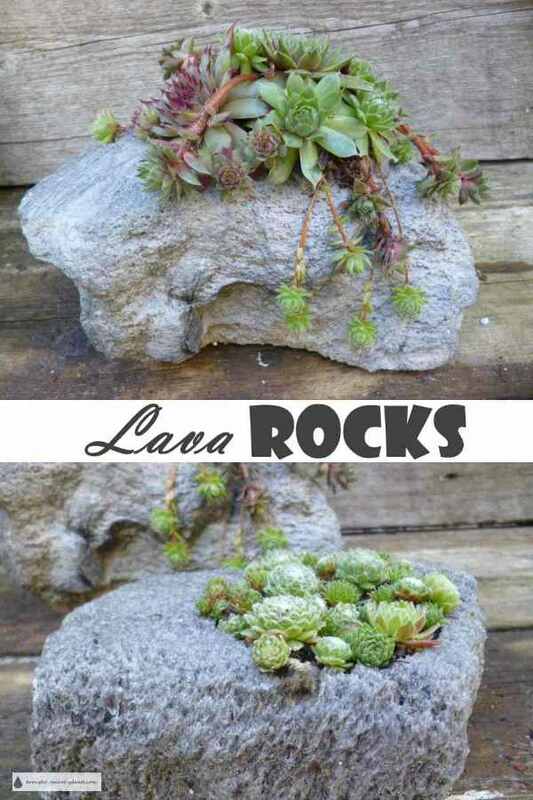 To care for the lava rocks over the winter, I suggest that you heel them in to a garden bed and cover with leaves just so the expanding moisture doesn’t break the rocks apart. In time, and the judicious application of yogurt or buttermilk, moss and lichen will grow on the lava rock surface, giving the impression of great age. Group your succulent collection in an eclectic selection of these rugged looking lava stones, tiny hypertufa pinch pots, and tin can planters. These unique lava rocks are natural, not man made, and therefore are all different. Choose from small, medium and large to suit your type of plants. 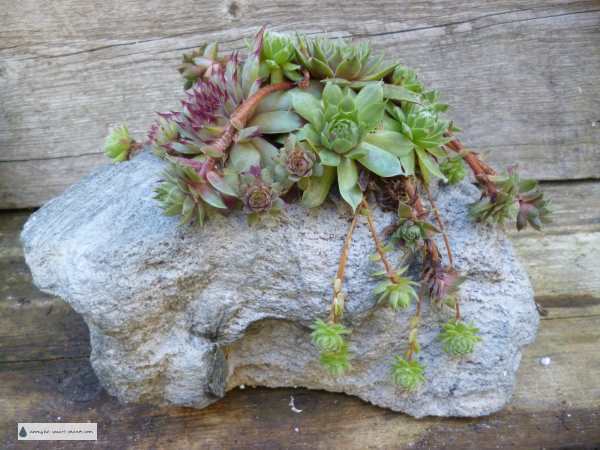 I plant Jovibarba species or the tiniest of Sempervivum arachnoideum in a small sized lava rock, which holds about a cupful of soil and can nestle in your open hand. The sheer numbers of the tiny Sempervivum species that can fit into this piece of lava rock is amazing - the whole rock is only about six inches ( 15 cm) at it's longest point. Even though this doesn't have a drain hole, there is really not much risk of it ever becoming waterlogged, because of the large pores in the rock itself. A larger rock needs larger Sempervivum; this one is around 9 inches on the largest side, and a correspondingly larger hole in it, drilled out with a drill press. Again, there is no drain hole, but the water just escapes into the rock itself. So far, none of the planted lava rocks have had any problem with being wet in the winter, there is no cracking or splitting evident.